If you were a fan of NBC's Hannibal series you're familiar with the stylish and deliberate use of gore and tension it reveled in week after week. The show may have been canceled but Action Lab's 'Tomboy' is its tonal cousin. It is also a slow burn with a shocking amount of violence.It may not share the show's visual flair, but it makes up for it in a deep conspiracy that continues to unfold with every issue. 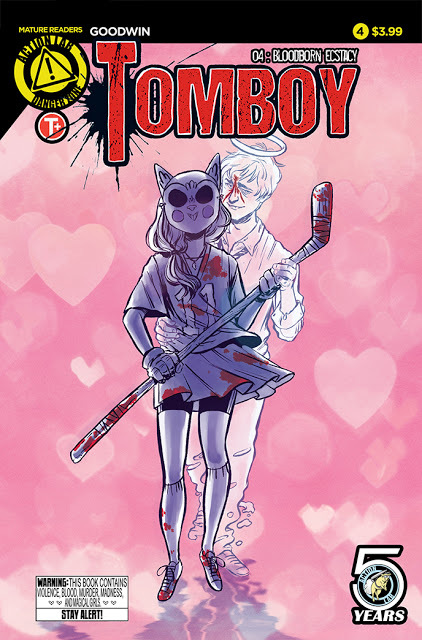 It is Action Lab's best book and that's not a slight to the publisher's other great titles but 'Tomboy' weaves a web so thick and tacky you can't escape its grip. Mia Goodwin has been able to blend the supernatural with the scientifically aspects of her story and turned it into a psychological thriller as well. Addison is our anti-hero vigilante, brutally killing a list of people complicit in the production and distribution of the controversial drug at the center of the series. It's been known to induce extreme psychosis and homicidal tendencies. So the question is, are the dead people and fairy Addison sees an ability passed down from her grandfather as we learned in the last issue or is it a product of the drug she may have been given? The apparitions in her life are encouraging her to kill. It's become a normal activity for Addison months after the death of her friend. The kills are gruesome with messages smeared in blood. Is this Addison's righteous crusade or is she being manipulated? We finally see Irene Trent, the person we've heard so much about, who's instilled fear in her minions as the head of Trent Pharmaceuticals. She does not disappoint. She's every bit the sociopath you'd expect to see. Her glee at torturing someone is chilling and her laissez-faire attitude at clipping fingers off is just the beginning. We get quite the amount of information from her discussion from her victim. It's a huge part of the mystery we've been wading through since the beginning. Goodwin does the pencilling as well and it's certainly lovely and cartoony but it holds so many contradictions. Addison looks like she should be starting a band with her friend Jessica. Or fighting dragons with a magical sword while on the back of a winged horse. Instead, she's an emotion-less killing machine who talks to a fairy and the ghosts of friends and loved ones. It adds to the melancholy of Addison's situation. A normal life usurped by other forces. Michelle Wong does a great job with subdued colors that paint scenes in specific hues from a dull sandy background in the captain's office to a transitioning blue sky at dusk with Irene. 'Tomboy' is a sophisticated, smart, thriller that will chill you to the bone. Goodwin spins the magical girl trope on its head and turns her into a possibly halucinating vigilante killer. The art belies the deadly motives behind the characters on the page and that makes for a compelling read. Get 'Tomboy,' talk about, share it, and enjoy it with twisted glee.